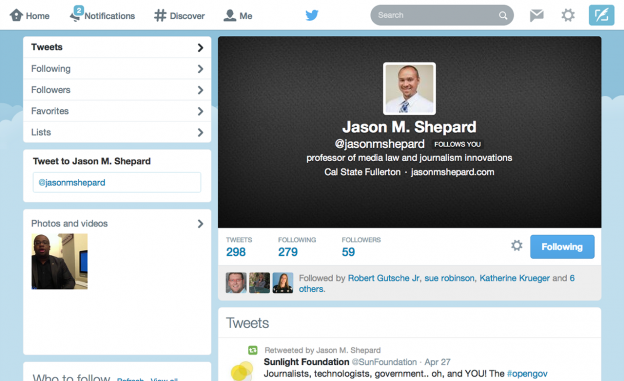 Journalism professor Jason Shepard is our EdShift test case on expanding a faculty Twitter presence. Join him on the journey. When I recently saw my friend and former teaching assistant Jason Shepard covered in a story on faculty using Twitter, I giggled a little. An accomplished writer, media law professor and soon-to-be-chair of the 2,500-student Department of Communications at California State-Fullerton, Jason has a lot of things to brag about — but his Twitter presence just isn’t one of them. “Do you know you only have 59 followers?” I texted him. These tools aren't merely a passing fancy. They're critical elements in both reporting and disseminating the news, as well as in connecting with the communities we cover. “LOL. I’m still a newbie,” he replied. Jason has novel ideas about using Twitter to engage students, journalists and fellow researchers. But without a following, where would he get? And then I decided this could be a fun experiment for EducationShift. Could we take a person with great ideas but few followers and test specific ways to build a network? Enter: The Follow Jason Shepard Project. Jason is absolutely right in taking to Twitter. Journalists and the people who train them need to understand the effective use of social media. These tools aren’t merely a passing fancy. They’re critical elements in both reporting and disseminating the news, as well as in connecting with the communities we cover. Christopher told us these are key skills our students must acquire, so they’re certainly elements we must cover in our courses. 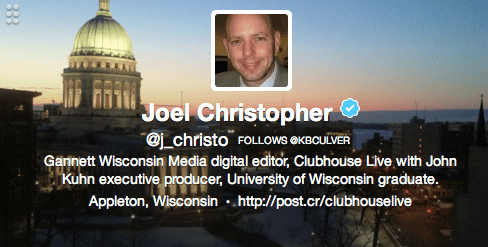 Gannett’s Joel Christopher knows the power of social media in today’s journalism environment. For any of us to have impact in these areas, we have to be using social consistently and effectively. Advice on Twitter for journalists and educators abounds, giving Jason useful tips. We want to test one specific aspect: how can journalism faculty build a Twitter following? Our experiment will cover organic practices, rather than some of the paid approaches Twitter offers, which can be terrific for media organizations. And we’ll stay strictly away from the patently unethical (and completely sketchy) use of buying fake followers. 1. Participate in a focused, tweeted event: This Friday, Jason will be tweeting, retweeting and favoriting from the UW-Madison Center for Journalism Ethics annual conference, which has a day’s worth of streaming video and live tweeting via #uwethics. We’ll test whether getting into a highly watched, targeted stream help can gain followers. 2. Follow people: Jason currently follows only 279 people. We have to add to that. We’ll start with the goal of following 500 accounts. But here’s the trick: he’s going to follow in clusters of related people. Twitter now alerts a user when a group of people he follows begin to follow an account. So for instance, if I follow @PBSMediaShift, @PBSIdeaLab and @MediaTwit and they all start to follow @JasonMShepard, I get an alert and may be more likely to follow him, as well. So Jason will do his following in bursts of related educators, journalists, lawyers, students and others. 3. Start lists: Twitter also alerts people when they’re added to lists. Lists also are a key way to stay organized and not fall victim to the time vampire Twitter can become. I’m a huge fan of the list organizer TwitListManager. It’s low production value but ideal for people who don’t build lists as they follow. Once you have your lists going, get in the habit of adding people as you follow them. 4. Tweet at people: Many people, however, tend not to follow merely when they’ve been followed. So we will see whether Jason can gain followers by doing more with @, guessing that including a person’s handle in a tweet related to her will stimulate her to follow. Given Jason’s extensive experience in media law and ethics, he’s going to tweet a good bit about these issues and include some notable thinkers. If he can get an RT from someone with a big following, he may strike gold. Tweeting on trending hashtags like #SCOTUS for Supreme Court decisions can help build visibility and gain followers. 5. Chase a few #trends: If a hashtag is getting a good deal of traction, Jason will jump on board, particularly if it’s related to his teaching or research interests. For instance, he’ll jump on #SCOTUS frequently as key Supreme Court decisions start coming down in the next two months. 6. Take some sides: To date, Jason’s 298 tweets have been primarily retweets and links to media content. These are fine but less likely to get retweeted, so he’s missing the chance to get more followers through the networks of those who retweet him. So when he RTs, he’ll add his own up-front comment. And he’ll make more statements in his own tweets, so his audience knows what he thinks. 7. Get consistent: This is where Jason and I are a lot alike: big bursts o’ tweets in some moments and then days of downtime. This makes you less visible and less likely to be shared. Jason is going to have a regular habit of tweeting at least three times a day. He’ll have more on some days, such as when the much-anticipated #SCOTUS decision on Aereo comes down. Now for the tough part. How many followers does Jason need to make all this work a success? This is where innovative educators have a special advantage. We know that we don’t always have to succeed to make an effort worthwhile. We can always learn in failures. That’s the lifeblood of experimentation. If he comes away with 159 followers or 559, he will have learned along the way. For his part, Jason is committing to give this test his best. Follow along with our work and help us by suggesting other follower-building methods in the comments below or on Twitter. We’ll be Storifying the Follow Jason Shepard Project and updating you at #FoloJason on #EdShift. Kathleen Bartzen Culver is an assistant professor in the School of Journalism & Mass Communication at the University of Wisconsin-Madison, teaching and researching at the intersection of ethics and digital media practices. Culver also serves as associate director of the Center for Journalism Ethics and Education Curator for PBS MediaShift. Follow her @kbculver. He could add an image to his profile to complete the look. But most importantly, he can schedule tweets that are not time sensitive. Buffer and SocialOomph are simple and free third party applications to use. Good idea and good luck; I just followed him.